Mondo Guerra was born and raised in Denver, Colorado. He attended Denver School of the Arts which is a magnet school within the Denver Public School District. After graduation he decided to pursue his dreams to make a name for himself in the art and fashion world and moved to New York City. Mondo said, "I was 22-years old living in New York, had a job in the Garment District and was on top of the world - I was successful. At the same time, I wasn't making the best decisions. I was not taking care of myself in many ways. "I felt invincible, like a lot of young people do. I never thought I'd be at risk or be infected." He went to his doctor for a regular check-up and was called back into the office and was then told the news, he was HIV-positive. He said of the diagnosis, "It was hard. I felt alone with nobody to confide in. I felt I couldn't talk to anybody, and I was depressed." Mondo moved back to Denver but he still wasn't talking to anybody about his HIV status. He said, "HIV was starting to define me and that wasn't the direction I wanted to go. So, I started focusing on my creative work. I went to an ASO and I started taking some responsibility." But he wasn't taking his meds regularly and he got sick. Being sick forced him to go to the hospital and that's when he decided he had a lot more to do. Still focusing on his creative work and fashion design, Mondo landed a spot on Lifetime's "Project Runway" season eight in 2010. Through that season, Mondo finished in the top, but didn't win a number of the initial challenges, but he won the challenges on the eighth, ninth and tenth episodes. During the tenth challenge, he revealed to the judges that his pattern was inspired by his HIV status, and that he had been keeping his HIV status a secret for ten years. He came in second place in the final competition for season eight held at Mercedes Benz Fashion Week at Lincoln Center in New York City. Project Runway Executive Producer Heidi Klum, who had pushed for Mondo to win during the final episode, appeared in a modified version of one of his final collection gowns for the Los Angeles premiere of the movie Black Swan a few weeks after the airing of the final episode. Mondo was subsequently cast in and later went on to win the debut season of “Project Runway All Stars” and became an audience favorite as a mentor on Lifetime’s spinoff series, “Under The Gunn”. "I was finally able to disclose my HIV status." Mondo continued, "My family was and is so supportive in every part of my life. I became my own advocate and became very responsible." 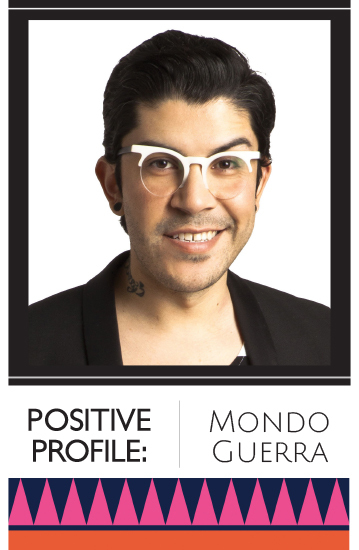 Mondo's celebrity has also given him the opportunity to be an advocate for others with HIV. He was commissioned to create a custom World AIDS Day design for the 2015 Subaru Legacy that was revealed during Art Basel, Miami and is a spokesperson for Merck’s I Design HIV/AIDS educational initiative. In 2013, Mondo became a national spokesperson for Dining Out For Life, an annual HIV/AIDS fundraiser hosted by Subaru. Mondo said, "I get opportunities to speak to groups and when I talk to young people, I always try to be as candid as possible. I like to say that there is self-love and don't under-estimate the power of unconditional love. I was silent for 2-years of my life. My mom said to me, 'I love you and I hope you can help someone else.'" He has been honoring his mom's wishes by dedicating a lot of his time to advocacy. Mondo is currently collaborating with Merck on "Project I Design," a national HIV education campaign aimed at helping to empower people with the disease to play an active role in designing their treatment plan with their doctors. Through I Design, Mondo shares his experiences with HIV and discusses the importance of people living with HIV to have an open and honest dialog with their doctors to address important topics such as how they are feeling on their therapies, other conditions they may have and other medications they are taking beyond their HIV meds. Mondo says, "Project I Design is a really great way to start a conversation, Even if you're not HIV-positive, you may know someone and be effected by it. It only takes one story to inspire someone. "My doctor has become my best friend to this point. HIV is still the number one topic when I talk to my doctor, but I talk to him about everything - it's important to have those conversations with your doctor." Mondo's advice to those who are newly diagnosed with HIV stems from his own initial struggles with the disease and being silent about it for so long. He says, "You need to create your support system. Family, best friends and local ASOs, they all can be wonderful resources." Professionally, Mondo has designed an exclusive collection of frames and sunglasses for national optical boutique SEE Eyewear, with a portion of sales benefiting amfAR. He has also collaborated on a line of shoes with Crocs, Inc. And he continues to develop his own label, offering his designs exclusively on his website, www.mondoguerra.com. Mondo is challenging himself for the future. With all of his accomplishments, he knows that there's a lot still to do and explore. He says, "My motto for 2016 is 'Change it up...do something unexpected.' I'm excited about that."